The Sufism and Psychology Forum (SPF) was created to explore the relationship between the study of Sufism and of psychology. Members from around the world are working to bring together the application of Sufi principles and practices and the study of psychology through research, translation, and discussion. 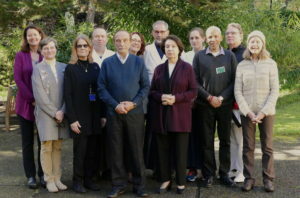 SPF has been successful in opening and maintaining an international dialogue among spiritual practitioners who work in the field of psychology, and in facilitating the integration of Sufi principles into the practice of psychology. Through the efforts of its members and the support of the International Association of Sufism, the SPF has made great strides since its inception in 1996 toward meeting its founding goals. The Sufism and Psychology Forum is a department of International Association of Sufism (IAS) and is not affiliated with any one Sufi school or order. For additional information, and to register please click here for the event page. The theme of the 40 Days: Alchemy of Tranquility annual retreat this year was “The Root of Security.” Looking beyond external solutions and psychological remedies, the program taught that the possibility of security depends on finding the stable point of connection within oneself with the absolute essence of Being which is Unity. The weekend was guided by Sufi masters Seyyedeh Dr. Nahid Angha and Shah Nazar Seyyed Dr. Ali Kianfar. Members of the 40 Days Team offered presentations covering topics such as attachment, memory, the physical system and faith, as well as offering martial arts practices and demonstrations, beautiful Sufi music by Taneen, poetry, and time for quiet reflection, meditation, and dialogue.